Check this out! This plastic cup isn't really a plastic cup. Huh? Have you been eating crayons again? The doctor told you not to. That was in kindergarten and no I haven't. Get this. 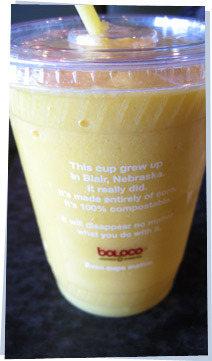 It says, "This cup grew up in Blair, Nebraska. It really did. It's made entirely of corn. It's 100% compostable. It will disappear no matter what you do with it." That's awesome. Hey Dex, I bet I could make your smoothie disappear too.